Two local DIY entities are working collaborativley to secure a new location for the DAAC, restructure the model for sustainability and bring the popular art venue to life again. Learn more, donate, connect with the DAAC. Learn more about DIT GR and get involved. For the past decade, the Division Avenue Arts Collective (DAAC) has been a definitive component of Grand Rapids’ independent arts community and a leader within the national DIY/DIT movement. 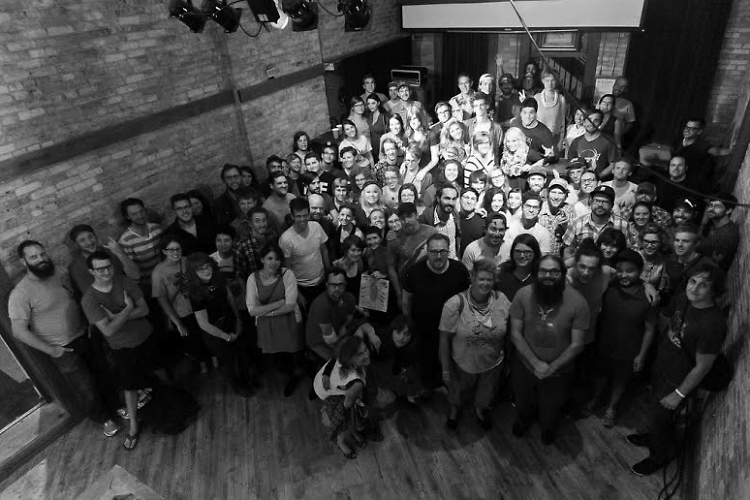 In July 2013, the collective was forced to leave its long-standing home on Division Avenue. News of the controversial eviction reverberated throughout the country’s all-ages, DIY scene. The DAAC chose not to dissolve but to instead initiate an effort to relocate and revitalize. This effort includes a closer partnership with another local, independent arts entity: Do-It-Together Grand Rapids. Up until its eviction, the DAAC had been an all-ages music venue, art gallery and DIY project incubator. It provided a safe, neutral and sober space for the artistic expression of all, despite age or other circumstance. It has always been run by an openly-elected board of volunteers and valued transparency and community involvement. 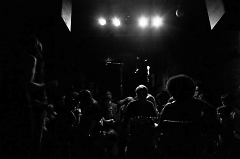 Since its founding in October 2003, the DAAC has hosted thousands of touring artists, including renowned acts such as Frontier Ruckus, Kimya Dawson, Screaming Females, The Blow and Xiu Xiu. Countless local, underground Grand Rapids acts have also relied on the DAAC as space in which to learn their craft and, in some cases, as a launchpad into regional, national and international success. Visual artists, dancers, poets, filmmakers and all other sorts of creators have shown and/or performed at the DAAC. This openness to artists and performers of all mediums, achievement and experience has perhaps been the collective’s most influential offering to the community. Last fall, the DAAC entered a fiscal sponsorship with Fractured Atlas, a national, nonprofit arts organization with the mission to support artists and other organizations, such as the DAAC. This sponsorship grants the DAAC virtual 501(3c) status, an important factor in fundraising. The collective ran a 40 day crowdfunding campaign via Rockethub. The campaign brought in $10,543. Another $3,890 was raised through private donations and series of benefit shows. The DAAC plans to continue raising funds. The DAAC has also developed a closer partnership with Do-It-Together Grand Rapids (DIT GR). 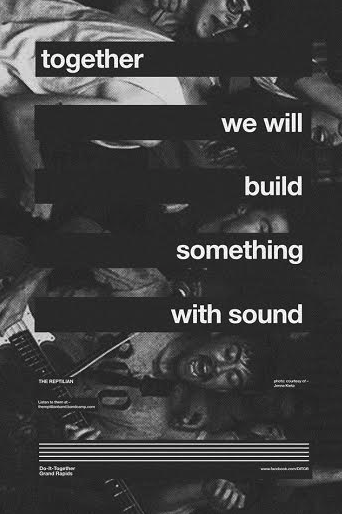 DIT GR is an open collective concerned with propagating, promoting and engaging the public with performances—musical and otherwise—in the context of house shows and small DIY/DIT venues. Since July, DIT GR has shouldered many of the city’s independent music events. The organization, however, is not simply a substitute for the DAAC. DIT GR, untethered to any specific space has a flexibility, both economic and otherwise. DIT GR participated heavily in Lamplight Music Festival 2013—a three day festival hosted in house venues throughout Eastown. The event garnered the attention of multiple media outlets in Grand Rapids and abroad. They’ve also accrued a pool of resources, including a team of graphic designers, booking agents and promoters, to support anyone looking to perform and/or facilitate an event with DIT GR. Since the DAAC’s eviction, most of DIT GR’s events have taken place in house venues around the city. House venues have become crucial to Grand Rapids’ independent, all-ages music scene, and the success of this house show model in the DAAC’s absence raises the important question of whether or not an all-ages space, such as the DAAC, remains relevant and needed in our community. Volunteer-run, all-ages venues have proven difficult to sustain across the nation, and the DAAC has been no exception. Vulnerable to high burnout rates among volunteers and competition from commercial, bar venues, the DAAC has notoriously scraped by month to month on show earnings. It managed to keep its doors open for almost a decade, but the DAAC was never able to significantly expand the resources it offered to the community. Despite these obstacles, Grand Rapids needs a dedicated, all-ages, public arts space. As flexible and magical as house venues can be, they are also volatile—dependent upon the continued support of tenants, landlords and neighbors. Despite the generosity of the individuals living in these home, the venues will necessarily lack a certain degree of the accessibility afforded to fully-licensed, public venues. Through partnership, the two organizations can better realize their full, focused potentials. The DAAC offers the stability and accessibility the house show model lacks, while DIT GR offers a distinct organizational and promotional emphasis. Unifying the efforts of the two organizations might just provide the balance and distribution of responsibility needed to produce a vibrant, effective and sustainable infrastructure for Grand Rapids’ independent, all ages arts scene—welcoming artists and audiences alike.